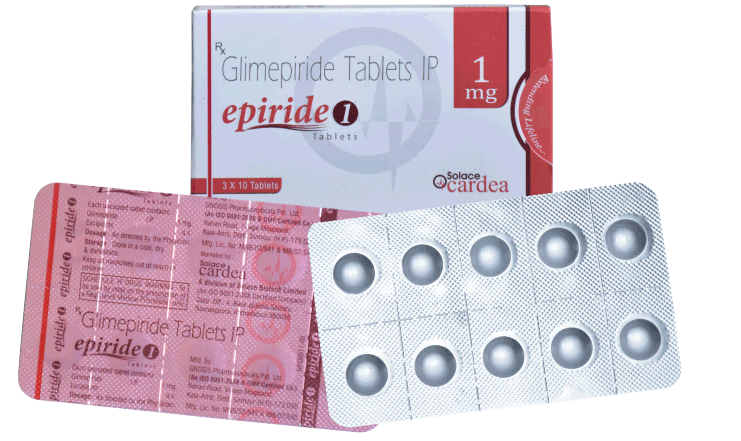 Epiride 1 Tablet contains Glimepiride. It is an anti-diabetic drug which belongs to sulphonylurea class which is long acting oral anti-diabetic drug. Once daily in the morning after meal. The drug stimulates the pancreatic beta cells which causes release of insulin. The drug bound to sulphonyl urea receptor in the pancreatic cells closing of potassium channel which causes release of insulin. This in turn causes lowering of blood glucose level. The drug is well distributed in the body by binding protein binding about 99.5%. The drug is metabolized oxidative biotransformation by oral administration.